Hello to you Sirs and Madams. Should you be regular readers then you are in for a treat. In a rare moment of calculation, I am writing this entry as a direct follow up to my most recent bog about sequels (http://www.chrisandphilpresent.co.uk/blogs/hollyweird/hollyweird-episode-xxvi-hollyweird-2-electric-boogaloo/). In fact ,this is the sequel to that very blog if you will. The very observational statement of such connectivity is making me stroke my chin hair smugly in appreciation. Hollyweird Episode 26 detailed films that I would consider to be underrated sequels. This topic is going now to be continued even though this individual selection only exists as a sequel in the loosest possible sense. In fact if the movie in question had have actually been a huge success then its bold stance on sequels would have eliminated a further five piss- poor rip offs of a classic, as well as a further two atrocious remakes. Indeed the world was nearly spared from a total of seven craptacluar movies in the Halloween via the cruelly neglected Halloween III: Season of the Witch. 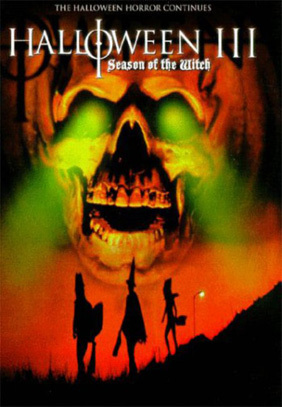 Halloween III: Season of the Witch may as well be called just ‘Season Of The Witch’. It actually has nothing to do with the previous two Halloween films which were based around the killing sprees of a certain Canadian comic’s namesake, Michael Myers. Both of the previous, Myers-based Slasher Halloween films had been huge financial successes. However the writer-director of both of these films, John Carpenter, decided that enough was enough. Thus to escape getting roped into a third movie, Carpenter ensured that he killed off the character of Myers in a fire. Instead Carpenter and his Producer/Wife, Debra Hill envisioned a complete ‘u-turn’ for any further films in the Halloween-series. I don’t know who drew this, but I likes it! Carpenter and Hill advised Universal Studios that the franchise name could still exist, but that the very title of ‘Halloween’ could be changed to represent an anthology of movies. Each year a new, stand alone horror film could be made using this banner name. Ideally then the studio would keep their franchise, whilst audiences would get a unique type of terror on annual basis from emerging new film makers. With the studio in agreement for the plan, both Hill and Carpenter became producers on the third Halloween film. They supported the hiring of old colleague and friend, Tommy Lee Wallace. Wallace was the Production Designer and Editor on Halloween, as well as a collaborator on Carpenter’s other films, Dark Star and The Fog. Thus the lineage of Halloween behind the scenes was set to continue, even if Michael Myers and his Carving Knife were never going to feature in the film. This is not Tommy Lee Wallace. But he did direct It. By 1982 Universal was now in agreement with the Carpenter’s proposed plan. They agreed to make a film titled ‘Halloween III’ that would exist as a different type of film altogether from the first two films. Well they sure couldn’t have gotten much more different! Forget the prior use of an escaped lunatic who chases kids. Halloween III: Season of the Witch involves killer robots, Stonehenge, evil curses, an Irish madman and a middle aged protagonist who is arguably more of a scum bag than an actual hero. 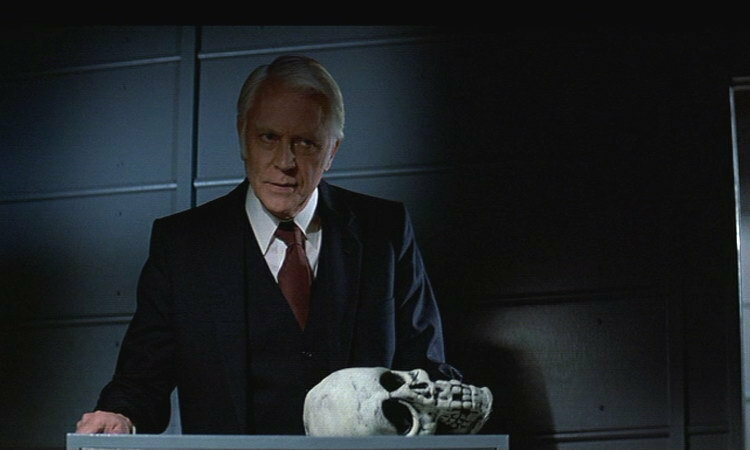 Allow me to elaborate by breaking down Halloween III’s plot. Season Of The Witch begins with a mysterious stranger being chased by a few more mysterious strangers. (In fact this is all a bit of an oxymoron- all strangers must be somewhat mysterious. Otherwise they would just be ‘known familiars’). At any rate, these strangers are all dressed in business suits. The chased man is clutching a rubber mask tightly as he collapses inside a Gas Station. He keeps repeating ”They’re going to kill us!”. 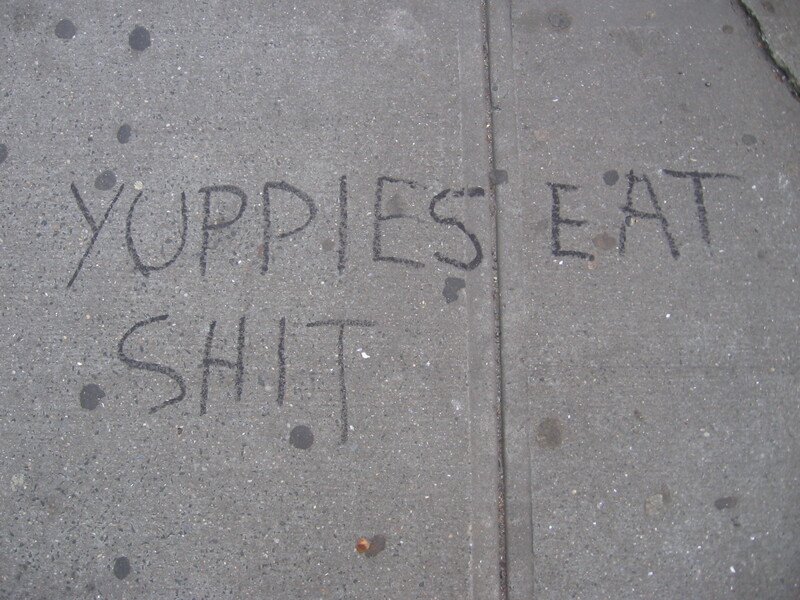 Still that’s yuppies for you- always wanting more. It’s not enough that they hound a man. They want to kill him too. The exhausted stranger is driven to the hospital by a clerk at the gas station. He is soon admitted to the hospital under the care of Dr. Challis. Challis is played by the grizzled character actor, Tom Atkins. Atkins is a man that for 3 decades across multiple films has always seemed a middle aged, angry, a red-blooded meat eater. This is somewhat fitting for a man who has his name is shared by a diet program. More to the point though, Atkins presence is also a sign that this film will not be dealing with teenage babysitters in peril. Instead Season of the Witch is going to be based around men in suits and middle aged doctors, and presumably even witches at some point. Already this is a different type of horror, possibly even a mystery, compared to the earlier Halloween films. The newly admitted patient is found to be called Harry Gambridge. Gambridge is soon visited by another mysterious man in a suit. This new stranger though is a tad more efficient than the previously discussed strangers in suits. The visitor in the hospital does not just casually chase Gambridge. Instead he kills him. The killer then heads off to his car and sets himself alight. Since the killer takes the time to kill himself in his car, I can only imagine even in the 1980’s smoking was not allowed in hospitals. Suffice to say Dr Challis is not too happy about this. As an alpha male, nobody gets murdered on his watch unless he is responsible! Naturally then, Challis decides to forget all about his other patients and join Gambridge’s daughter, Ellie, into investigating this entire scenario. Hey if Quincy MD and Diagnosis Murder’s mark Sloan can disappear to solve crimes, then why shouldn’t Atkins. Besides which he clearly fancies the young Ellie. So that’s all OK then. Just a father and daughter hwalking along. Nothing to see here… Oh god, no! They’re lovers! There only clue that the pair have is the rubber mask that Harry was clutching as he collapsed inside the gas station. It is a novelty Halloween mask made by The Silver Shamrock Company, so the duo begin their investigation by heading towards the Silver Shamrock Factory. Mo, Larry and Curley had seen better days. This factory is located in a small town just outside of California. Actually, the factory pretty much is the town. When Ellie and Dr Challis check into a hotel by the plant, they are informed by the owner that this entire town works at the factory. It is a town of Irish descent and they owe all of the prosperity to local Irish business man, Conal Cochran. Although since the town’s entire ‘prosperity’ seems to amount to a factory and a motel, they should perhaps just buy Conal a Guinness and call it even. OCP Stocks? I’d buy that for a dollar! Nonetheless, Ellie and Challis stay at the motel after discovering that Harry had also previously stayed there. Being a reckless Doctor and a young girl, they get a single room and soon sleep with one another. After all, Atkins is pure man, baby. There are some more hotel guests alongside the Doc and Ellie. They are a toy store owner, and a family of three. These additional characters pretty much exist solely to die quite nastily. This is a horror film after all. Easily the most stand-out of these deaths is that of fellow Motel patron/cannon fodder, Marge Guttman. Guttman is in her room playing with one of the Silver Shamrock tags that are normally attached to the rubber masks. She makes the mistake of trying to open this tag when suddenly her whole face gets lasered clean off! This is proof that even horror sequels can be educational. Should one ever see one of those grey-discs attached to clothes in a shop, do not try to remove it yourself. It may not have dye in it. It may have a lethal booby trap. Back into the main protagonists of the film, Ellie and Dr Challis mange to get onto a factory tour of the Silver Shamrock plant. Ellie ends up kidnapped by more of the yuppies, and in attempting a rescue Dr Challis discovers that these business men are actually just robots. I do not type that as a similie for the modern workplace, I mean they really are robots. Made of wires and metal and terrible haircuts. Soon enough, Challis and Ellie end up the captives of the Conal Cochran aka the OCP guy from the Robocop series. Conal turns out to be descended from Druids who wish for the commercialised, modern Hallowe’en to return to its original form of Samhaim. This original form will involve sacrificing children’s souls to keep the world in more in line with the ancient powers that be. Although it is equally feesable that that a lifetime of working in a toy factory has just left Conal hating kids. Conal plans to revive the ancient power of Samhaim via a stolen boulder from Stone Henge (really) which he has incorporated pieces of into alongside computer chips (really). These mystically-endowed computer chips are then hidden within the tags on the Halloween masks (really) and will be powered by evil Celtic magic (really). These masks hidden powers will then be triggered by a secret code embedded via a Television advertisement (really). Consequently, any child wearing a Silver Shamrock mask at midnight who sees the said advert will turn into a pile of bugs and snakes (really). To be fair to mad old Conal, it’s certainly a more original plan than Michael Myers repeated stabbing of teens. Although it’s a pretty out there plan when he could have just poisoned some candy and given it out. Naturally Dr Challis, being the pure Alpha Male that Tom Atkins embues, manages kill Cochran and destroy the factory and rescue Ellie. Not bad for a middle aged Doc who originally sneaked off for some rumpy pumpy from a young girl in mourning. As they drive away into the sunset, Challis is suddenly attacked by Ellie. She is not Ellie at all, but is another android! Atkins overcomes her, possibly by ripping her circuits out with his bare teeth. Or possibly by driving the car into a ditch. Believe whichever scenario you prefer. Challis manages to stumble to a reach a payphone to warn the Television Station not to air the Silver Shamrock commercial. Unfortunately he does not reach every station in time though. The signal is sent. The film ends as we hear Challis scream as his very own children begin to devolve…. Although to be honest the children should never have been up in time for a midnight commercial anyway. Also there are several time zone issues with this concept. Still, logic loops are almost always forgiveable if they lead to an enjoyably dark ending for a horror film, and they don’t come much darker than mass enficide. Now given the off-hand manner in which I have recounted Halloween III: Season of the Witch it may seem as though the film is dumb-trash. This is actually not the case. My recounting of the plot is more down to how absurd and varied it is. The way the film unfolds is actually pretty strong. The film drips bleakness from the start. There is a sense of nihilism right away, something often necessary but overlooked necessary for creepy films. The beginning of the movie has its lead- a Doctor- unable to save his patient from being murdered under his very own nose. This very same Doctor then abandons his position of care- and even his family- to try and hook up with a young lady who has just had her father murdered…. And this lead character is the ‘hero’ of Season of the Witch! By the end of the film, dot only does Dr Challis fail to save America’s children, but he also fails to save his own family. This being the very same family he abandoned on a sexual whim. Put simply, Challis fails and the world pays the price. Meanwhile as viewers, the audience is exposed to killer robots, face-melting lazers, a Celtic Pagan- psychopath and magic that kills children. These threats seem to randomly crop up from the very start of the film onwards, often with no prior-hint or warning. The net result is to create a world where death lurks around every corner regardless of how fanciful it may be. Between unexpected scientific and supernatural murders, as well as a protagonist that is not a clean cut good person, Season Of The Witch is the equivalent of a Fox news report. It informs the viewer that they are doomed. Part of this gloom in the film no doubt comes down to the choice of screen writer, Nigel Kneale. Kneale was a Science Fiction writer of quite some pedigree, having gained acclaim for his work on creating the Quartermass Experiment series. Kneale wrote the original screenplay for Halloween III: Season of the Witch. Although the final form was so altered that Kneale asked for his name to be removed from the credits. Yet despite many changes it would seem that Kneale’s use of Science Fiction and Fantasy to highlight the hopelessness of man still hangs over the final film. Given the present tropes of a horror films- reduced lighting, nasty special effects and haunting music- the total film becomes a sheer attack of nihilism on the senses. In this regard Halloween III is certainly a triumph as both a horror movie and as a part of the Halloween series. Much as with Michael Myers, terror is presented here as always worryingly present and unstoppably fantastical. Interestingly Season Of The Witch did actually turn a profit almost immediately. Made for approximately $2.5 Million, the film made over $14 Million just at the U.S. Box Office. The film was certainly no failure. Still, this positive return was just no match for the cash that Myers appearances had brought in. So out went the Anthology concept and back once again came Michael Myers, via the subtly named Halloween 4: The Return Of Michael Myers in 1984. Sadly Myers return led to bigger box office returns than the braver Season Of The Witch. Consequently more slasher Halloween films were made leading to Myers seeming-immortality having to be addressed. Frankly, this was a terrible idea. In the continuation of the original series, ( Halloween: H2O, aside) Myers was revealed to be a part of a global conspiracy. He was born into a secret cult that stole his soul. Now he must butcher his whole family to save the world from supernatural destruction! Yep. That all really happened in the series between parts 4-7. Sigh. Even old Donnie P couldn’t escape the paycheque of… The Cult of Thorn! Meanwhile in the second series of Myers films that were ‘re-imagined’ by Rob Zombie, a decision was made to avoid the Cult Of Thorn altogether. Unfortunately these remakes did something just as dumb; Zombie used this opportunity to completely negate the terror of Myers. No longer was he a mysterious, silent killer that could represent the ‘boogeyman’ of anywhere. Instead he became a 7 foot giant with a Jerry-Springer type of background that explained all his behaviour away. Oh and he had a psychic connection to Laurie that involved a big white horse. Both routes of the Myers-fasciantion killed off any mystique or terror surrounding the actual character himself. Whether it was a cult that makes his soul-less form invincible or a completely explained back story of a White Trash nutter, Myers was no longer scary. Meanwhile Season Of The Witch may be pretty strange and fanciful, but it does exist as a rare and bold attempt to keep a franchise going whilst having zero to do with the previous films. Season Of The Witch could have also potentially led to any number of interesting scary stories not beholden to any previous entries. Potentially these ad-hoc Halloween films could have constantly be helmed by fresh film makers, giving the entire series an eclectic and energetic feel. Admitadlly, depending on your love for the Myers character and your association with him as the Halloween franchise,then perhaps a non-Myers film sounds like a terrible idea for the series. But honestly, could it have been any worse than what ultimately happened to pale face two times over!?? Next time will be a look at a man with a voice soaked in bourbon and nicotine- and no, it’s not Joe Pasquale in a Noir movie.